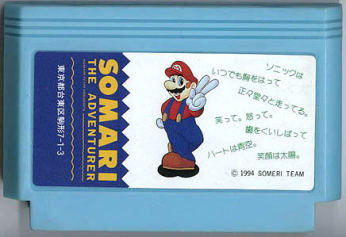 This Somari Cartridge is quite inventive. Someone has drawn Mario in Sonic's pose, and used the Sonic Japanese writing scheme. This cartridge is pretty weak looking. A Mario image from Super Mario 64 has been plastered onto the Knuckles' Chaotix boxart. You can see Vector in the background. 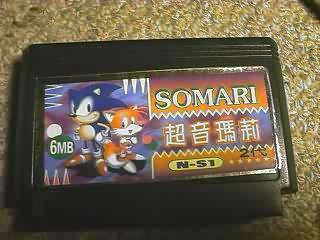 An even cheaper cart cover, this one just has some Sonic 2 artwork stuck on with the name Somari on it. 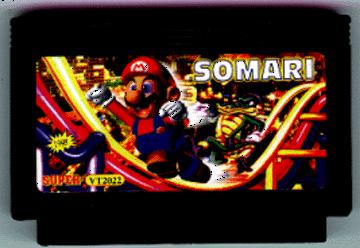 It's actually a direct rip of the SoniSon cart, but that is for Sonic Blast 5.